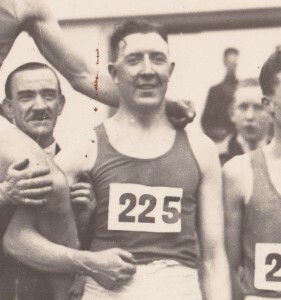 Probably the biggest relay meeting held in Scotland was the inter-club championship help in Glasgow in June which had at least five relays and at one point six as an essential part of the programme. There have always been clubs in Scotland that do sterling work for the sport and then just disappear, almost without trace. Perhaps because the spark that created them has left the sport for whatever reason, perhaps because good as they were the club was in the shadow of a much bigger outfit whose sheer size and momentum prevailed. One such club was St Peter’s AAC which was based in the west end of Glasgow. 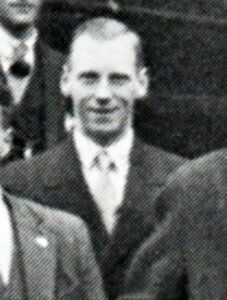 The club competed well and contributed to athletics in the area but its real contribution was in the organisation of the big Inter-Club Meeting in June every year from 1928 to 1936. Held on 2nd June, 1928 at Shawfield Park and before a crowd of 2000 people, there were to start with four open races – 100 yards handicap, 100 yards scratch, 440 yards handicap youths and half-mile handicap. The real business however was the inter-club contest which involved six relays, a four miles team race, and five field events. All branches were involved: sprinters, middle distance men, long distance runners, hurdlers, jumpers and throwers all were catered for. The trophy awarded was the “News of the World Challenge Trophy”. That particular newspaper sponsored many events across the length and breadth of Britain with the four multi-stage inter-city relays being the biggest and best. The event would settle into the second Saturday in June at Celtic Park, but the first was on the first Saturday. “It was generally expected that with the strength at their disposal, Maryhill Harriers would take pride of place at the meeting organised by that enterprising young club, St Peter’s. In the mid-distances with D McLean, WH Calderwood, W McRoberts, GP Inglis and A Mair they have a string that no other club can compete with at the moment, and winning four of the six relay flat events they won the trophy with a comfortabkle margin from the West of Scotland Harriers. 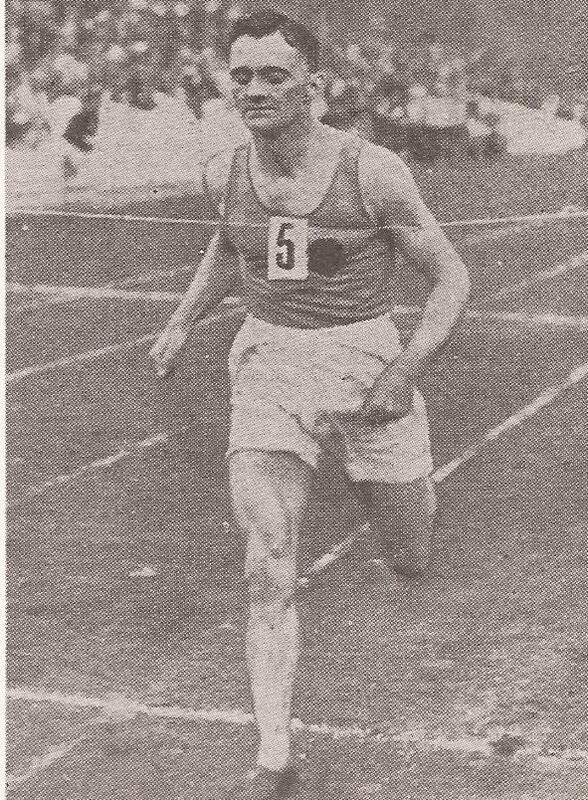 The last-named club, for whom PW Brown confirmed his fine running of a week ago, were not over-weighted in the shorter distances, and won two events, the quarter mile and the mile, due in no small measure to smart understanding at the hand over. It will be noted straight away the some names appear more than once – in inter-clubs there are always demands made on athletes to ‘double up’ no matter which decade in athletics history we are speaking about. The quality of these athletes was very high indeed and the results of relays and team races are noted here. 440 yards relay (4 x 110): 1. West of Scotland (PW Brown, JG Scott, S Bernstein, AF Clarke). 2. Maryhill H; 3. Shettleston H.
880 yards relay (4 x 220): 1. Maryhill (WP Andreoli, DE Duncan, T McLean, R Kennedy); 2. West of Scotland; 3. Bellahouston H.
Mile Relay (4 x 440): 1. West of Scotland (AF Clarke, PW Brown, H Elliott, JD Hope); 2. Maryhill; 3. Shettleston. Four Miles Relay (4 x 1 Mile): 1. Maryhill Harriers (GP Inglis, T Cowan, WH Calderwood, D MacLean; 2. Garscube H; 3. Camerons. Championship Cup: 1. Maryhill 20 pts; 2. West of Scotland 13 pts; 3. Cameronians 11 pts. As far as the field events went, Maryhill only won the high jump while the Field Events Club won the hammer, 2nd Cameronians took the long jump, Glasgow Police won the putting the weight. If 1928 was a success, 1929 was a revelation of the interest taken in an inter-club contest by Scotland’s athletes. The meeting was on 8th June and all cncerned were assessing the athletes form for the SAAA Championships which were to be held on 22nd June – just two weeks later. It is pleasant to be able to record in these supposedly materialistic days, that 15 clubs, representing some 500 athletes, can be fund willing to take part in an inter-club contest where individual glory plays second part to the team spirit. It fell to the lot of St Peter’s, one of the youngest but one of the most enterprising clubs in the Western area, to discover this fact a year ago, and the success which attended their meeting at Scotstoun on Saturday demonstrated that the clubs were again more than anxious to participate in a meeting of this kind. The competition throughout was keen and it was not until the very last event on the programme, the broad jump, that victory rested with Glasgow University by a bare margin of 2 points over Maryhill Harriers who were winners a year ago at Shawfield. In a meeting of this kind it is somewhat difficult to assess individual values, but several of the candidates for championship honours acquitted themselves well, and we had the added satisfaction of seeing two Scottish champions, in James Crawford and KM Smith, in action for the first time this season. 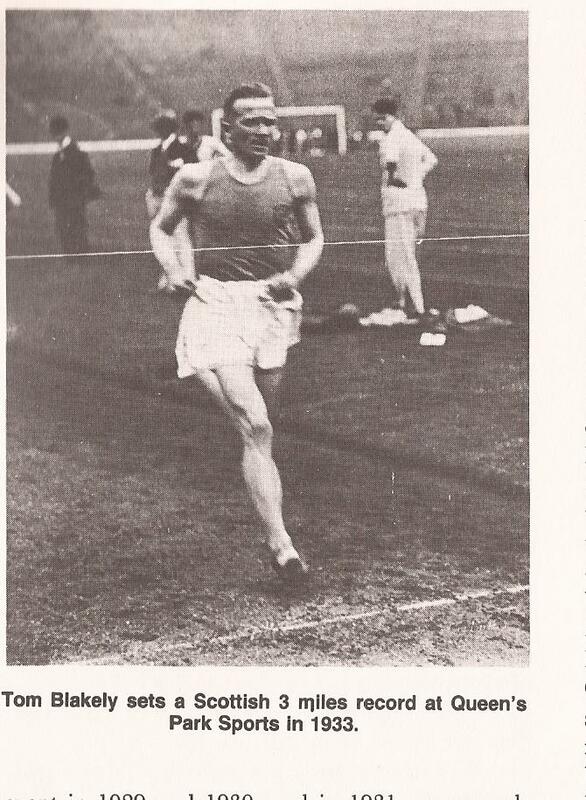 The Queen’s Park flyer, who ran in Shettleston’s colours in the two shorter relays, moved well enough to suggest he will be fit and ready for June 22nd. He was beaten in the final leg of the 440 relayn by JA Robb on practically equal terms, but an impartial survey of the race suggests that this was due as much to an indifferent change-over as to any inferiority in pace. …. Three Miles team race: 1. Plebeian Harriers (Gunn 1, Rayne 3, Lamont 11 = 14 points); Springburn Harriers (J Stevenson 4, R Allison 6, A Stevenson 7 = 17 pts; 3. Maryhill 28 pts. Such was the emphasis on the inter-club nature of the event, that even the field events were included but with the results calculated as for distance track races. eg Maryhill won the high jump with the aggregate height of two representatives being 11′ 0″ (Smith 5′ 8″, Bulloch 5′ 4″) with the Field Events Club being second with a total height of 10′ 8″ and the 2nd Cameronians third with 10′ 2″. With three throws and two jumps, the field events were important in deciding the destination of the event. The News of the World Trophy in 1929 went to the University who had a total of 16 pts, from Maryhill on 14 pts and the Cameronians on 9 pts. Three Miles team race: 1. Maryhill Harriers (D Wright 1, Muir 3, Robertson 4); 2. Bellahouston H; 3. Garscube H.
Glasgow University won the trophy largely because Maryhill Harriers got almost no points at all in the field events wheras the students picked a couple of firsts, a second and a third. a. open events had increased in number from four in the first match to eight this time round plus two cycle races. c. There were three races for women, one of which was a relay -100 yards, 220 yards; 440 yards relay . Edinburgh University and Maryhill Harriers were the strongest women’s teams with Glasgow University also providing a placed runner. d. Celtic Park had a concrete cycle track outside the cinder track and so for the first time it was possible to hold a 440 yards cycle race and a one mile cycle race without interfering with the state of the track. The meeting on 13th June 1931 was again held at Celtic Park and there were again innovations and changes to the format. Two Miles Junior Relay: 1. Plebeian H (Blackwood, Armstrong, Black, Illingworth); 2. Garscube H; Victoria Park. 480 yards hurdles relay: 1. Glasgow University (Selkirk, Souter, Taylor, Kitchin) walked over. 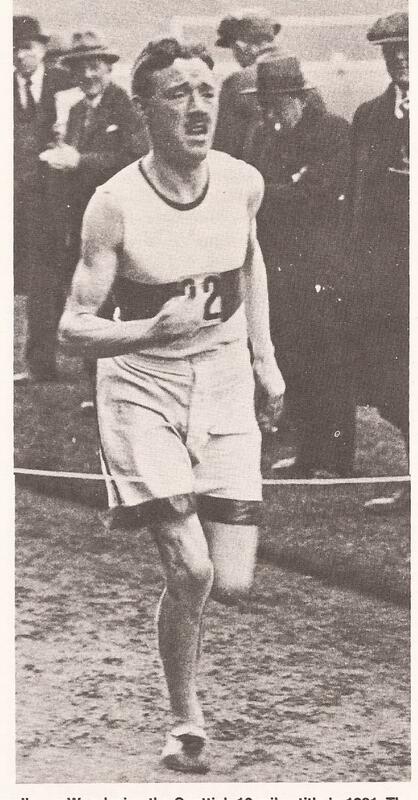 There were two records set at the meeting – Tom Blakely of Maryhill set a new Scottish record for three miles of 14 min 38 1-5th sec and Constance Johnston, SWAAA champion set a new record for the half mile of 2 min 24 1-5th sec. The open track events were held but this time there were no cycle races at all and the two miles junior relay had been dropped. 440 yards relay: 1. Maryhill H (Turner, McBride, Bell, Brown); 2. Edinburgh University; 3. Glasgow University. One Mile team race: 1. Shettleston Harriers (Sutherland 2, McCubbin 3, Young 12); 2. Garscube H; 3. Glasgow University. Three Miles team race: 1. Plebeian H (Tombe 1, Gunn 2, Armstrong 5); 2. Maryhill H; 3. Garscube H.
Although there was no team in the team race from Heriot’s FP, JF Wood was first to finish in the three miles in 15 min 7 3-5th sec. Three Miles team race: 1. Garscube Harriers (Bennett 3, Lindsay 5, DB Brooke 7); 2. Shettleston H; 3. Springburn H.
In the field events, Shettleston Harriers won the shot and the javelin, Glasgow University won the broad jump West of Scotland won the high jump and Glasgow Police won the hammer event. It should be pointed out in defence of the Harrier clubs, that one of the reasons they did not embrace the field and heavy events was probably a lack of appropriate facilities. The Universities with exclusive use of Westerlands and Craiglockhart with equipment for all the events available on demand. They also of course had the time for training and in addition the actual work done by most athletes in the shipyards, factories and coal mines was more physically demanding than the life of most students. The university teams might well have won the championship in any case – they had some superb athletes – but the above factors (access to facilities, less time for training and a more physically demanding lifestyle) are offered in defence of the harriers. 440 yards relay: 1. Garscube Harriers (Walker, J McIsaac, JT McIsaac, Pitcairn); 2. West of Scotland H; 3. Maryhill H.
880 yards relay: 1. Bellahouston H (Thomson, Gallagher, Lawn, Fraser); 2. West of Scotland; 3. Maryhill. Mile relay: 1. Maryhill H (Terry, Cairns, Scholes, Morrison); 2. Victoria Park; 3. West of Scotland. Two Miles relay: 1. 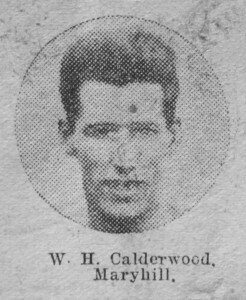 Maryhill H (MacLean, Morrison, Osborn, Calderwood); 2. Victoria Park; 3. Plebeian H.
480 yards hurdles relay: 1. Bellahuston H (CG Gordon, Arnott, Wyper, OG Gordon); West of Scotland finished but were disualified. One Mile team race: 1. Maryhill H (MacLean 1, Osborne 7, Calderwood 8); 2. Garscube H; 3. Plebeian H.
There was no St Peter’s AC Inter-Club contes held in 1936 – or in 1937 or 1938 either. There were so many other meetings that they may have been crowded out of the calendar. There were only three Saturdays available in June: the fourth was always the SAAA championships, and on that Saturday there were a couple of minor meetings such as Lugar Sports. The first Saturday in June was always the Quen’s Park FC Sports which was a very attractive draw for athletes and the other regular meetings were the Singer’s Factory Sports at Clydebank and the Alloa meeting. It would have been hard for a club to get all their best men out for a meeting such as the inter-club on that date. The second Saturday was not any easier and that was traditionally the date for St Peter’s event: the Universities usually had their championships on that date and we hav seen how important their presence was for the Glasgow meeting. It was also unfortunate that the Babcock’s Sports had been going for five or six years by 1936 and it was offering the Empire Exhibition Trophy to the club with most points at the meeting which had two relays (4 x 100 and medley) and a track team race in addition to points for places in most events on the programme. It almost duplicated some aspects of the St Peter’s programme and it was easier to forward a team. And it was on the same day. On the third Saturday it was the Glasgow Police Sports: formerly a professional meeting it had joined the amateur ranks and proved to be very successful with some really good relays (normally two per programme). There was also an Edinburgh meeting on the third Saturday and the Dalmuir United FC had their sports on that date. d. Stop holding the meeting. They were a small club, crowds were usually described as ‘moderate’ with no figures given, and they maybe just did not have the personnel or the drive to continue. However it turned out, there were no more inter-clubs held by St Peter’s. This was a pity because it was at a time when there were no track leagues of any form and whole club competition has a lot to commend it. It filled a gap, and right well did it do it.